In combination with the Drager X-am 5000, 5100 or 5600 gas detection instruments, the the Drager X-zone 5500 provides state-of-the-art area monitoring. The system can be used for the measurement of up to six gases and extends the portable gas detection technology to a unique system with many applications. The Drager X-Zone 5500 transforms the Drager personal gas detection instruments X-am 5000, 5100 and 5600 into innovative area monitoring devices for a wide range of applications. A patented combination for increased safety - in addition to the personal air monitors carried on the body, these area monitors are positioned where gas hazards are expected. Even from a distance, the illuminated green LED ring indicates that the air is free of toxic and combustible gases. Upon detection of gas hazards, the LED color changes from green to red, thus providing a clear visual warning that gas is present. Additionally, a loud and highly audible evacuation alarm is emitted. The Drager X-zone 5500 gas entry is located that the gas can diffuse into the Drager X-am 5000, 5100 or 5600 from all sides. 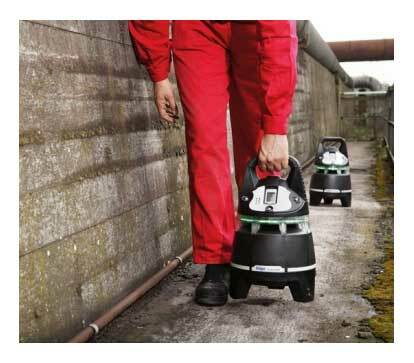 The 24 Ah battery of the Drager X-zone 5500 provides up to 120 hours of continuous operation - a complete working week. Up to 25 Drager X-Zone 5500 can be automatically interconnected to form a wireless fenceline. The interconnection of the area monitoring devices allows for rapid establishment of safety networks for larger areas. A Drager X-zone 5500 detecting a gas alarm transmits the alarm signal to all interconnected units. A red flashing master alarm in the mother unit detecting gas contrasts with red/green flashing alarms of the connected daughter units providing simple recognition of alarm status and the actual location of the hazard.